There are many television shows about hunting. But the Freedom Hunters series, we believe, deserves special recognition. Freedom Hunters arranges “once-in-a-lifetime” outdoor hunting adventures for American military combat veterans. Footage from these hunting trips, along with background stories on the service men and women chosen for the hunt, are packaged into weekly cable broadcasts. 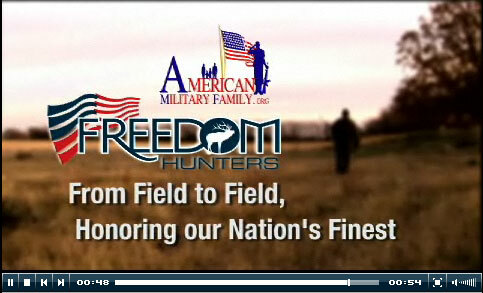 Click the image below to visit Freedom Hunters’ Video Archive. There, click on the “PFC Josh Reilly” link to view great clips from a Wyoming hunt. Freedom Hunters is looking to present an all-expense-paid Wyoming pronghorn hunt to a female veteran. Freedom Hunters producers are specifically looking for women who have served in Afghanistan or Iraq. The hunt will be guided by Llano Outfitters (Casper, WY, 307-235-4865), one of Wyoming’s premier elk, deer and pronghorn outfitters. The hunt will take place in late October 2009. Applications must be received by March 15, 2009. The woman selected to participate in this hunt will receive gifts from product sponsors and will be featured on a future episode of the Freedom Hunters television show. Those interested in applying for this opportunity should apply via the Freedom Hunters’ Application Page on the web. Freedom Hunters is a 501(c)3 charitable organization serving the American military family. It is dedicated to honoring those who protect our freedoms. For more information about Freedom Hunters Programs, visit FreedomHunters.org or e-mail info [at] freedomhunters.org. Freedom Hunters airs Fridays at 4:00pm MST on the Altitude Sports and Entertainment network. Share the post "Freedom Hunters Organizes Hunts for U.S. Military Veterans"
Throughout 2009, Sightron is offering purchasers a $50.00 rebate on Sightron SII Big Sky™ riflescopes. To qualify, just purchase any Sightron SII Big Sky™ Series riflescope before December 31, 2009. These scopes feature the ExacTrack™ windage and elevation system, a Broadband lens coating process, one-piece main tubes, and Sigtron’s Lifetime Warranty. CLICK HERE for Rebate Application Form. This offer is valied in the USA only. Purchase of an SII Big Sky™ scope must be made between January 1, 2009 and December 31, 2009. To qualify for the rebate, purchaser must submit Sightron coupon with original sales receipt, warranty card and UPC sticker by March 31st 2010. Rebate offer cannot be combined with any other discounts or offers. Share the post "$50.00 Factory Rebate on Sightron Big Sky Riflescopes"